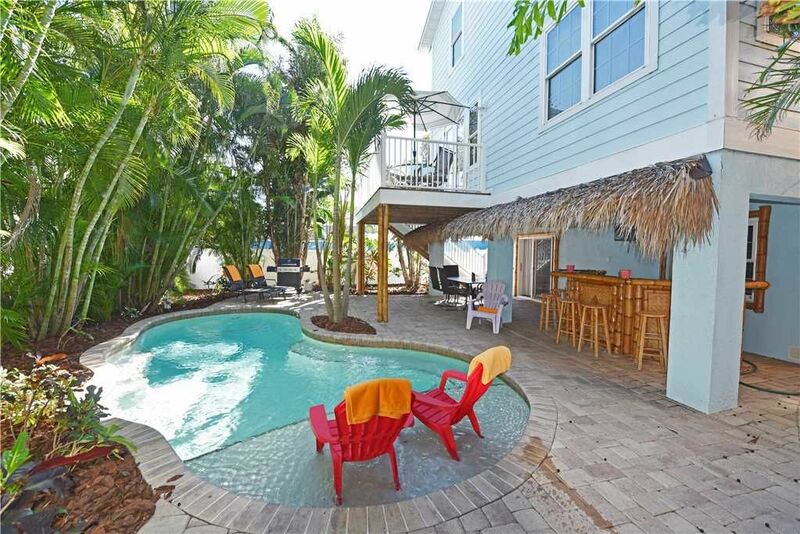 Key West meets Anna Maria Island in a dream vacation home. Island Retreat combines the best of both worlds, oozing a traditional south Florida style outside, with shaded balconies and intricate wooden architecture, with unrivaled, modern luxury on the inside. Built to the most exacting standards, you will be left in no doubt exactly where you are - paradise. With four bedrooms, three bathrooms and plenty of interior space, Island Retreat will waste no time in whisking your troubles away and filling your head with thoughts of relaxation. From the Jacuzzi tubs in the two master en-suites, to the tiki bar and your electrically heated private pool in the tropical landscaped gardens, and huge open-plan lounge and dining area for sharing those precious moments together, you will know you���re in a special place before you even explore all Anna Maria has to offer. Bathroom #1 has a full bathroom with a jacuzzi tub and walk-in shower. Bathroom #2 has a full bathroom with a bathtub. Bathroom #3 has a full bathroom with 2 sinks and a walk-in shower. This property is on our Professional Linen Program. It is a 2 minute stroll to the beach. It has a tropical heated pool with a Tiki bar near the pool area and West-facing views of the Gulf. This property worked well for our family of 8, ranging in age from 6 to 73. Plenty of sleeping accommodations and storage for “stuff”. 5 minute walk to the ocean and everyone enjoyed the heated pool. Can’t say enough positives about the free trolley system. Easy way to navigate the island. Temps were cool our week, but we still had a wonderful family vacation! Karen, thank you for leaving us a review! We are glad that Island Retreat worked well for your whole family with the proximity to the beach and heated poo, giving you and your family a wonderful vacation! We hope to have you again! Very nice beach house in a nice location with plenty of space & easy to walk to beach! Nice pool & ping pong table & grill. Great for family & friends to be together & eat together while relaxing in a wonderful place! Beds were great & awesome showers with huge closet space.Will definitely come back!! Joan, thank you for the awesome review! We're thrilled to hear that you had a wonderful time, and that the pool, ping pong table, and grill supplied you with tons of fun! We'd love to have have you back soon! Fabulous house and great location to the beach and town! It was clean, which is the highest priority on my list, comfortable and up-to-date. Three families shared this home and we were truly able to relax in it. My boys loved the heated pool! The ping pong room was an extra treat. Thanks for having some sand toys on hand! The only downside was that it did not have great WiFi. We would definitely recommend this home and we are looking forward to going back one day. Thank you for taking your time to have us a 5 star review! We love hearing about your stay, and that it was fabulous, clean, and in a great location! We look forward to having you back for more amazing memories on the island!